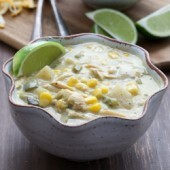 A flavorful slow cooker recipe for roasted poblano, corn and chicken soup! An easy meal for any day of the week! Roast poblanos, using the grill or oven. If using the oven, set temperature to 500°F. Place peppers on a foil covered baking sheet. Roast until skin is charred. Flip once to char the other side. Carefully remove skin and chop. Add chopped peppers, onion, potatoes, garlic, spices, chicken breast and chicken broth to the bowl of a 5-6 quart slow cooker. Cover and cook on high for 4 hours, or low for 8. When your cooking time is up, remove chicken breast and shred with forks. Set aside. For a thicker consistency, puree 2 cups worth of soup contents in a blender, food processor or using an immersion blender. Return blended ingredients and shredded chicken to slow cooker bowl, followed by drained corn and 1 cup heavy cream. Stir to combined. Continue cooking for 30 additional minutes. Serve with optional lime wedges, cheese or sour cream. Use boneless, skinless chicken breast, fully thawed.